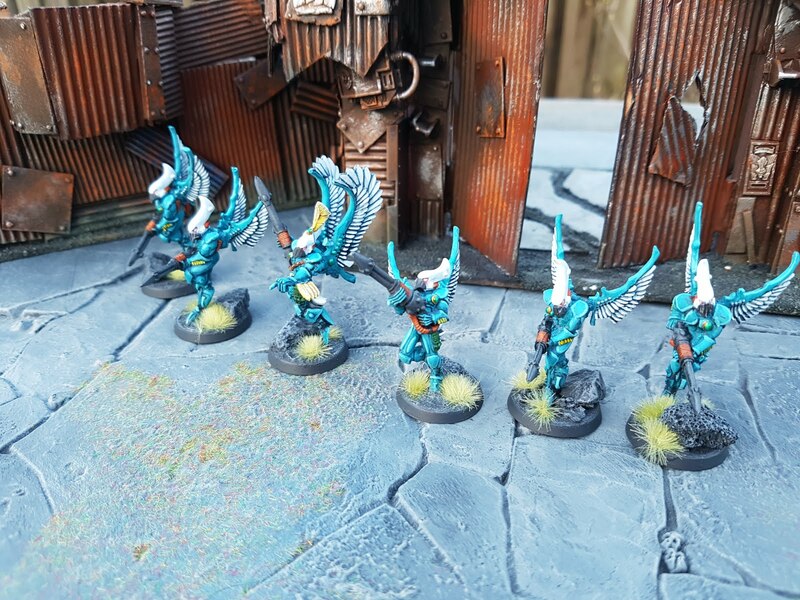 Last week I finished repainting my Eldar Swooping Hawks. I'm not sure why I keep bringing these guys to battle as even Ork t-shirts tend to deflect their masterfully aimed shots. But on the bright side they aren't as much of an eyesore in the display cabinet anymore, so there's that. Here we are, please stop killing us! When I got back into Warhammer 40K with 5th edition I almost exclusively played my brother's Necron. That faction had an annoying indestructible Monolith and (after building an Eldar army) a lot of my second wave purchases where aimed at taking the 'in' out of that 'indestructible'. The Swooping Hawks got their place in my warhost because they had haywire grenades. Unfortunately my habit of throwing Deep Strike mishaps gave this unit the moniker 'blood smears' (they have to share it with my Guardians). I recently tried them in the latest edition and it turns out the moniker stick, even without deepstrike mishaps. Apparently I'm supposed to 'surprise drop' them on an objective near the end of the game. That's a problem. I like use my toy soldiers to go 'pew pew' at the enemy. So I'll probably keep bringing these guys in to shoot, see a lot of successful enemy armor saves and then watch them die. They're also out of haywire in this edition so no more vehicle killing. It's all a bit sad. On the bright side: they get to be sad in shiny new armor! They do drop some regular grenades before they die. I did not paint the Swooping Hawks when I purchased them, being in a hurry I just applied a drybrush and called it a day. This has annoyed me no end for years. My Eldar vary wildly in the quality of their paint jobs, but these where real eyesores. 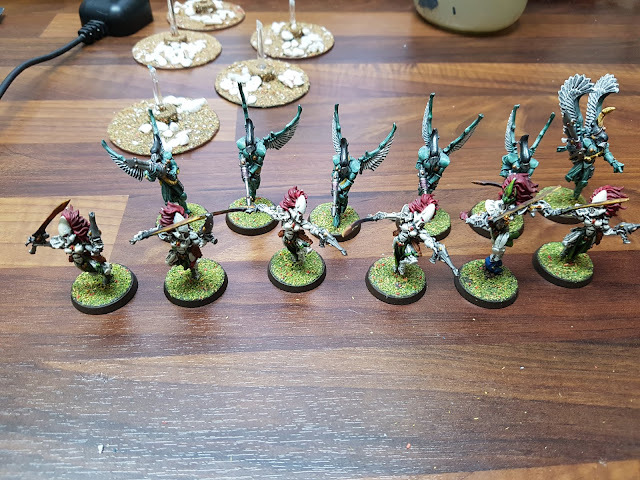 So when I decided it was time to finish (most of) my Eldar I decided to strip these embarrassments and give them a real paint job. I have to admit I'm quite satisfied with their current look. I especially took time to layer the wings and I think it shows. It also gave me a chance to work with one of my favorite current colors: Stegadon Scale Green, using the bright orange on the lasblasters (flashlights) to give a nice contrast. The same Swooping Hawks before I stripped them. Looking back I should've taken a better before picture. 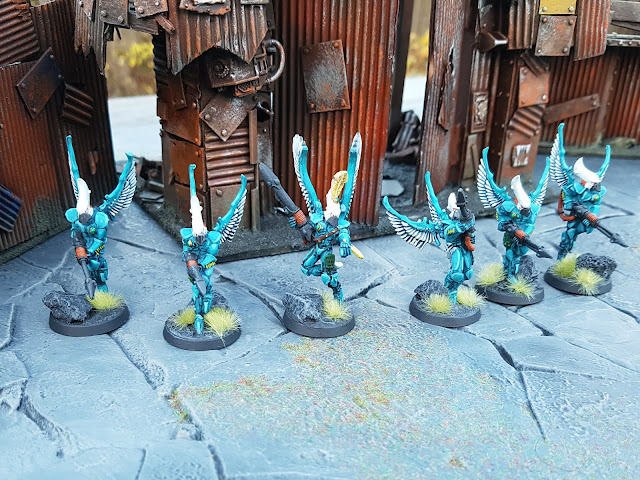 But here's a quick shot of the Swooping Hawks as they where (the Banshees are in the process of being repainted right now). Aside from these guys I've completed the hoarding for my Mighty Fortress, but I have to paint it. I'll throw that in a separate post later on. Then there's a lot of Skaven incoming. I've ordered the Battle Tome and the Endless Spells. The Gnaw Holes look interesting but, to be quite honest, rather easy to replicate to a reasonable standard myself. So I think I'll find out the base size and do a quick build (and maybe a tutorial) later on. But first I'll quickly get back to more Eldar, quick quick before the Skaven show up! Hard to tell from the "before" picture, but they seem to be improved, and they are quite nice now! I keep thinking that "this year will be Eldar year", but here we are half way through February, and I have not painted anything yet... as always your output seems so staggering.